In less than four months, DigitalGlobe plans to launch its WorldView-3 Earth observation (EO) satellite. In addition to offering 0.31-meter-resolution panchromatic and eight-band multispectral imagery, WorldView-3 was licensed by the National Oceanic and Atmospheric Administration (NOAA) to collect eight-band short-wave infrared (SWIR) imagery, making it the only EO satellite with such capabilities. WorldView-3 imagery is expected to make it easier to identify small but critical details within an image that often are indiscernible within the visible spectrum. The satellite will join DigitalGlobe’s constellation, currently comprising IKONOS, GeoEye-1, QuickBird, WorldView-1 and WorldView-2, allowing the company to image any spot on Earth twice daily. Add to this Airbus Defence and Space’s duo of Pléiades 1A and 1B satellites, and there’s no shortage of very-high-resolution optical satellite data. 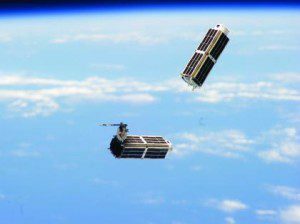 Two Planet Labs EO cubesats are jettisoned from the ISS’s Kibo module. You don’t need to be an aerospace giant to grab a piece of the action these days. Tiny San Francisco-based Planet Labs began launching its micro EO satellites, or cubesats called Doves, from the International Space Station (ISS) on Feb. 11, 2014. A total of 33 were released from the ISS Kibo module, forming a constellation the company calls its Flock, with more to come. be limited—but that’s OK, according to Chris Boshuizen, chief technology officer. Similarly, Mountain View, Calif.-based Skybox, another smallsat startup, sees an industry that’s experiencing tremendous disruption through launch-cost reductions and with modern commercial electronic components that are capable of high performance and high reliability in orbit. 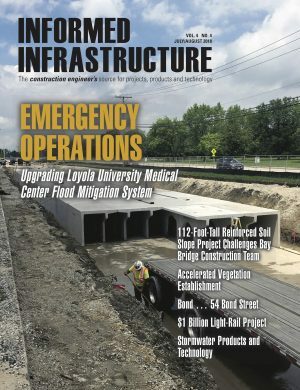 The circuitry that drives a SkyBox satellite—providing power, attitude control, communications, thermal management and imaging support—is about the size of a phone book and consumes less power than a 100-watt light bulb. 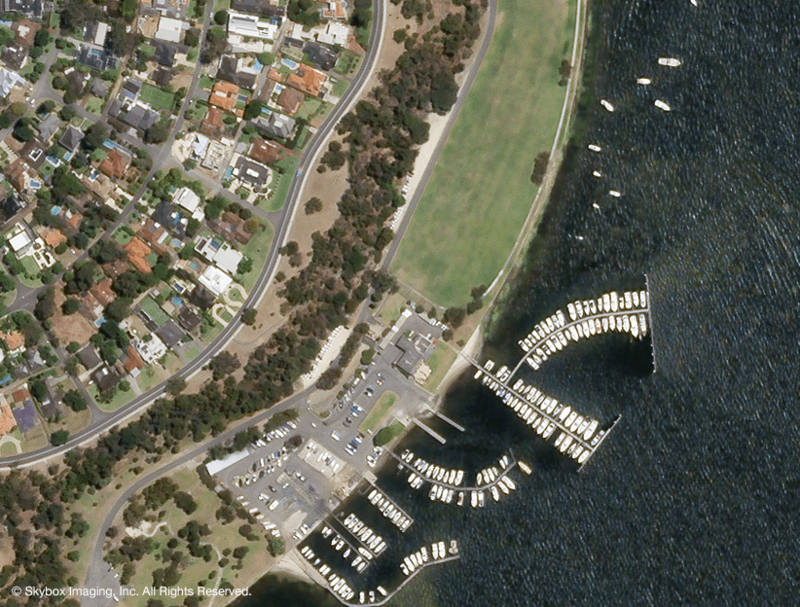 This sub-meter image of Beaton Park in Perth, Australia, is one of the first images collected by SkyBox’s SkySat-1. The company launched its SkySat-1 on Nov. 21, 2013. It is the first of a planned constellation of 24 satellites that are roughly 5 percent the size of a “traditional” high-resolution EO satellite. There are far too many other optical EO satellites to mention here, as well as radar satellites, which are useful for peering through cloud cover when optical sensors are essentially useless. One thing is certain: Global growth of all types of space-based EO initiatives is on an upswing, but it may surprise you to learn where much of the growth is coming from. Despite an overall stagnation in general spending on space programs, emerging nations, such as Algeria, Malaysia and Nigeria, are among the countries developing autonomous EO capabilities. To learn more, read Emerging Space Programs Spark Earth Observation Growth.